Watch The Biggest Loser Finale With Us! 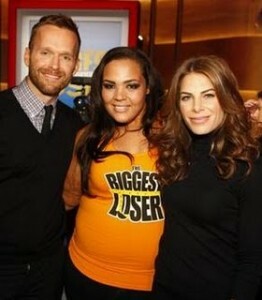 Join The Biggest Loser Finale Party! We are so so SO excited for The Biggest Loser finale tonight. As huge BL fans (and Bob fans! ), this is like Christmas for us—a whole two hours of before-and-after photos of people who have changed their lives. Woohoo! If you’d like to watch along with us (and please do, it’s a blast! ), be sure to follow us on Twitter and hop in the discussion. Besides dishing on what’s going on during the show, I’m happy to announce that we’re also a panelist for Subway’s #GOSHAY Twitter party! For those of you who don’t know Shay, she was the largest female in BL history with a weight of 467 pounds. Last season she dropped a whopping 172 pounds, but Subway has given her an incentive to keep going. For every pound she loses from the Season Eight Finale until the Season Nine Finale, the sandwich chain will donate $1,000 per pound. So if she loses another 100 pounds, she gets $100,000. So cool.